This is another recipe I found on Skinnytaste that I couldn’t resist. I adapted it a bit to work with what I had on hand. I was disappointed that I couldn’t find black sesame seeds anywhere because I think the slaw would looked even more beautiful with them. 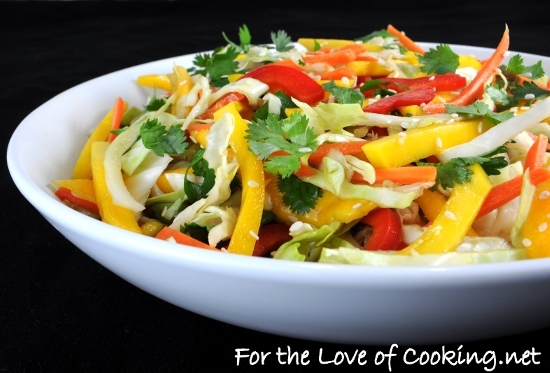 I loved the crunchy cabbage, carrots, and bell pepper with the sweet mango and tangy dressing. My kids didn’t say much about this slaw but they did eat nearly all of their portion which is great. My husband and I both loved it and had seconds. This cabbage mango slaw paired perfectly with the Asian Turkey Meatballs with Lime Sesame Dipping Sauce for a healthy and delicious meal! Combine the rice vinegar, lime juice, soy sauce, and sesame oil together in a small bowl. Whisk until well combined; set aside. 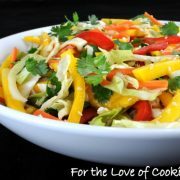 Combine the cabbage together with the carrots, cilantro, green onion, and red bell pepper in a bowl and toss together. Add the sliced mango and sesame seeds then drizzle with the salad dressing. Gently toss to combine. Serve immediately. Enjoy. Very crunchy, refreshing and colorful salad , Pam! Love the dressing! I seriously love everything in this, especially the mango slices! I can’t wait to whip this up and make some tacos with it! That is so pretty looking!!! I bet the flavor is outstanding. And your previous one also piqued my interest!!! You always make me hungry!!! That looks delicious! I love mango in more savory dishes. How gorgeous is this salad? I can’t wait to make this with the turkey meatballs. Gorgeous and delicious??? How can you beat that??? Very cool recipe! Skinnytaste has some good ones. I like how colorful it is, and I bet those meatballs are amazing. I will be trying this, for sure. i have everything i need for this except a mango, must go to store now! Looks so good, my family would love this vibrant salad. They love mango! Saludable y de lindo color me encanta las ensaladas son un éxito seguro,hugs,hugs. 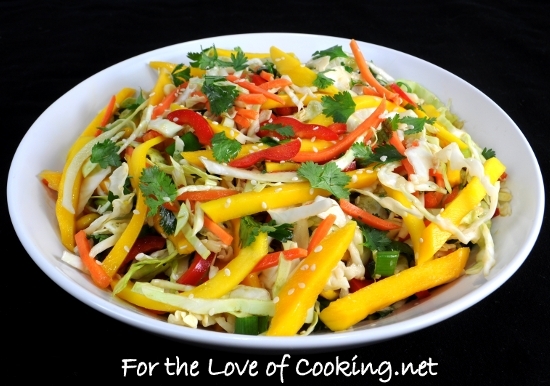 The mango slices would absolutely make this slaw for me! I really like the sound of a mango slaw! This sounds amazing. 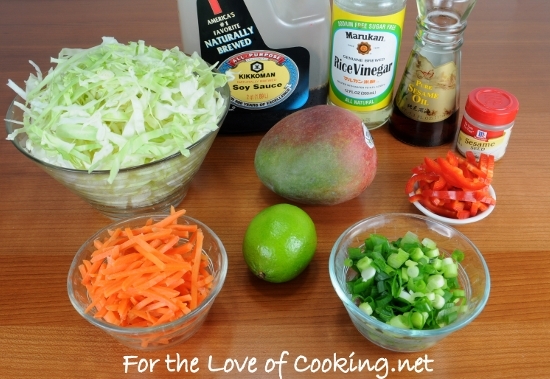 I love the colors of this mango slaw. I made both the salad and the meatballs last night. I had originally planned to have ravioli but when I saw these pictures, all my plans went out the window. Both recipes were great. My guy loved both. He’s a big cilantro fan and he loved the salad’s crunch. My only recipe comment was that when I used the 1/4 cup measure for the meatballs, I only got 10 so I redistributed the meat because I wanted 12! My last question is to myself – why does cabbage go ALL over the kitchen when I cut it up?! I will have to make this salad. Looks so BEAUTIFUL and APPETIZING! It’s really looks beautiful and delicious! Loved the slaw, hated the dressing….